I love Mt Pleasant Ave. It's vintage Toronto. It still has two movie theatres, lots of interesting one of a kind shops, tons of restaurants and until last Wednesday, Penrose Fish and Chips. Unfortunately, Penrose is now closed forever. Any business, that has been in business for 64 years, deserves a lot of credit, especially when you consider that this particular business started out as a "mom & pop" style small local eatery, that served the best fish and chips in the world!! OK, the "mom and pop" changed a little over the years - but just a little. The last name, Johnston, never really changed. It had been the owner's name since the first Mr. Johnston returned from WWII and started a small fish and chip shop in Toronto. In fact, the first "mom," Mrs. Johnston, who had worked in the business for 62 years, passed away just a year or so ago. What I hadn't realized was that the business had actually started out at Gladstone Ave. and Dundas St. and then moved to Mt Pleasant and Penrose Ave. 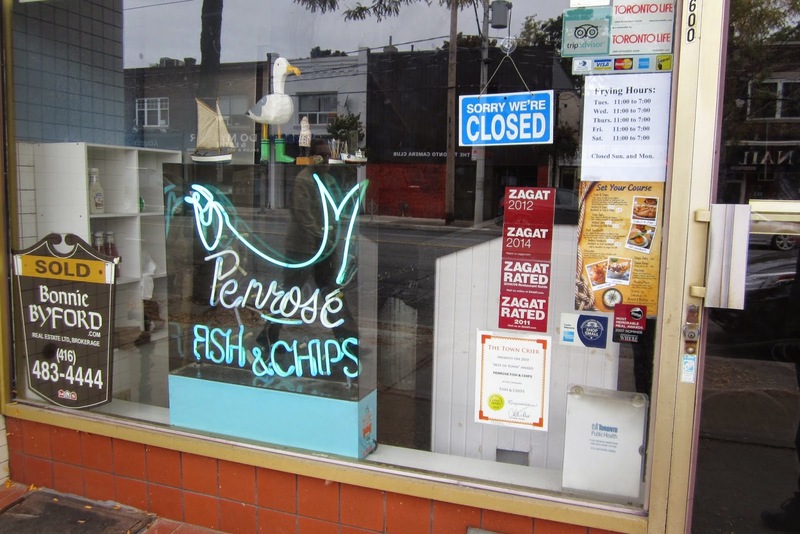 I had for years presumed that Penrose Fish & Chips had always been on Mt. Pleasant. It wasn't until last night, when my husband, who had managed time to read the articles on the shop, mentioned that they had had their first shop very near my grandparents' house. This was a eureka moment, because I always remembered a fish & chip shop near Gladstone Ave., when I was very young. After my father came back from the war, he would occasionally bring home a feast for all of us from this particular fish and chip shop. He would say that it was just like the fish and chips he had had in London. Well Gladstone's loss was Mt. Pleasant's gain. However, in the beginning, it wasn't always about the food. It was often about supporting businesses started by soldiers, who had come home from the front and were given small grants, either to start a business or to go back to school. Yes, we all loved the fish and chips, but we also wanted Penrose to survive. We wanted to get soldiers back to civilian life; we wanted to move on!! My father also took his beat up old Plymouth to a mechanic on Dufferin St., who morphed his talent for fixing aircrafts, into fixing cars. That's how we got back on our feet - one chip and one bolt at a time, with a mutual support system. With so much unemployment these days, we need to do more of this mutual supporting. Too many people are outsourcing their dollars to the Amazons of this world, forgetting that the bricks and mortar, mom and pop businesses got us to where we are today. Don't abandon them now!! We didn't abandon Penrose and there were huge line-ups and even film crews, at the shop, on their last day. There's a lot to be said for staying the course, keeping to the basics, believing in who you are and delivering the most amazing customer service for 64 years.